The Tamiya R/C Tiger 1 Early Full Option in 1/16 scale is a radio control model tank kit. 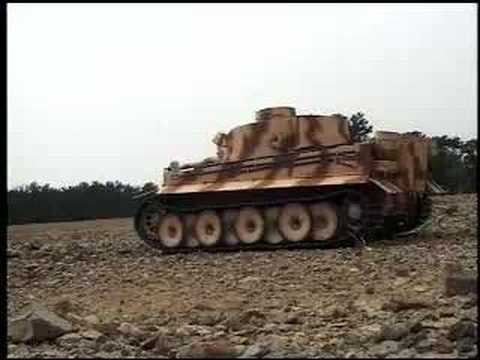 Just about every sound the real Tiger I made can be made on Tamiya's 1/16 scale Tiger I. NEW: Photo Etch Grilles Upgrade Set Now Available. When the tank is switched on, either a manual crank start sound, or an automatic engine start sound is heard. After your engine is turned over, its time to move the tank around. As you accelerate, the engine thundering increases just like the real Tiger I. Stop the tank, and the sound of authentic idling begins. Once you have located your target, rotate the massive turret and listen to the grinding of gears of the real German war machine. The more you control this Tamiya R/C tank, the more you will feel like the commander of the full size Tiger I.
Tamiya has put incredible power and versatility of the German Tiger I in your fingertips with this 1/16 scale, fully functional RC tank. Install 53447 1/16 R/C Tank LED Battle System (sold separately) for exciting 1-on-1 or team battles with other similarly equipped Tamiya R/C tanks. Great service and have never let me down yet always helpful and super fast on deliveries will always use for my stuff. First time order from wonderland will most definitely use again ordered tank evening of Tuesday delivered midday Thursday quick and prompt service also able to track parcels progress and time of delevery, 5 star service. Excellent service. Very quick delivery and communication with Wonderland Models was very efficient. Great price. Thank you. A nice kit to build everything fits perfectly in place, the batteries, 2 required can be accessed easily through the turret when removed leaving the top part in place. The top deck is held in place by two small screws which can only be removed when the turret is taken off, and is best left in place unless you have to get at the radio Rx. I received all my purchases in very good time. I am very pleased with the service provided. Thank you.